Grid Graph, supports layered worlds. The GridGraph is great in many ways, reliable, easily configured and updatable during runtime. But it lacks support for worlds which have multiple layers, such as a building with multiple floors. That's where this graph type comes in. 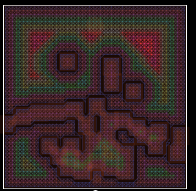 It supports basically the same stuff as the grid graph, but also multiple layers. It uses a more memory, and is probably a bit slower. Does not support 8 connections per node, only 4. Calculates the grid connections for a single node. Convenience function, it's slightly faster to use CalculateConnections(int,int) but that will only show when calculating for a large number of nodes. This function will also work for both grid graphs and layered grid graphs. Calculates the layered grid graph connections for a single node. Node in the specified cell in the first layer. Returns null if the coordinate is outside the grid. If you know the coordinate is inside the grid and you are looking to maximize performance then you can look up the node in the internal array directly which is slightly faster. Node in the specified cell. Get all nodes in a rectangle. Region in which to return nodes. It will be clamped to the grid. Buffer in which the nodes will be stored. Should be at least as large as the number of nodes that can exist in that region. The number of nodes written to the buffer. If true, the penalty of the nodes will be reset to the initial value as if the graph had just been scanned. If true, the penalty will be reset to zero (the default tag). For a layered grid graph this will recalculate all nodes at a specific (x,z) coordinate in the grid. For grid graphs this will simply recalculate the single node at those coordinates. This must only be called when it is safe to update nodes. For example when scanning the graph or during a graph update. This will not recalculate any connections as this method is often run for several adjacent nodes at a time. After you have recalculated all the nodes you will have to recalculate the connections for the changed nodes as well as their neighbours. Nodes with a short distance to the node above it will be set unwalkable. If two layered nodes are too close, they will be merged. All nodes in this graph. Scaling of the graph along the X axis. Calculates the grid connections for a cell as well as its neighbours. This is a useful utility function if you want to modify the walkability of a single node in the graph. Center point of the grid. Returns if node is connected to it's neighbour in the specified direction. This will also return true if neighbours = NumNeighbours.Four, the direction is diagonal and one can move through one of the adjacent nodes to the targeted node. Settings on how to check for walkability and height. If disabled, will not cut corners on obstacles. If connections is Eight, obstacle corners might be cut by a connection, setting this to false disables that. Depth (height) of the grid in nodes. The graph can be eroded after calculation. This means a margin is put around unwalkable nodes or other unwalkable connections. It is really good if your graph contains ledges where the nodes without erosion are walkable too close to the edge. A high number of erode iterations can seriously slow down graph updates during runtime (GraphUpdateObject) and should be kept as low as possible. 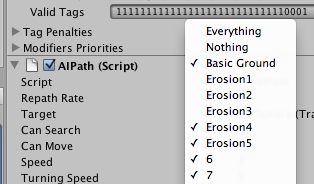 Tag to start from when using tags for erosion. Use tags instead of walkability for erosion. Tags will be used for erosion instead of marking nodes as unwalkable. The nodes will be marked with tags in an increasing order starting with the tag erosionFirstTag. Debug with the Tags mode to see the effect. With this enabled you can in effect set how close different AIs are allowed to get to walls using the Valid Tags field on the Seeker component. In GetNearestForce, determines how far to search after a valid node has been found. All nodes inside the shape. All nodes inside the bounding box. Transform a point in graph space to world space. This will give you the node position for the node at the given x and z coordinate if it is at the specified height above the base of the graph. Determines the layout of the grid graph inspector in the Unity Editor. This field is only used in the editor, it has no effect on the rest of the game whatsoever. Determines how the size of each hexagon is set in the inspector. For hexagons the normal nodeSize field doesn't really correspond to anything specific on the hexagon's geometry, so this enum is used to give the user the opportunity to adjust more concrete dimensions of the hexagons without having to pull out a calculator to calculate all the square roots and complicated conversion factors. This field is only used in the graph inspector, the nodeSize field will always use the same internal units. If you want to set the node size through code then you can use ConvertHexagonSizeToNodeSize. Angle to use for the isometric projection. A perspective view of an isometric graph. 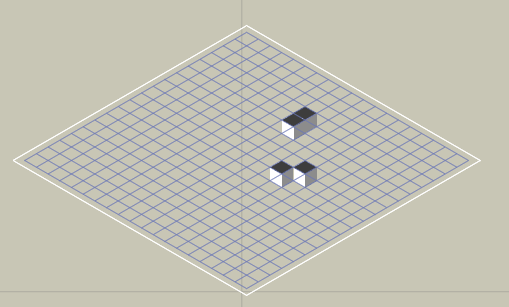 A top down view of an isometric graph. Note that the graph is entirely 2D, there is no perspective in this image. Usually the angle that you want to use is either 30 degrees (alternatively 90-30 = 60 degrees) or atan(1/sqrt(2)) which is approximately 35.264 degrees (alternatively 90 - 35.264 = 54.736 degrees). You might also want to rotate the graph plus or minus 45 degrees around the Y axis to get the oritientation required for your game. You can read more about it on the wikipedia page linked below. Returns true if a connection between the adjacent nodes n1 and n2 is valid. Also takes into account if the nodes are walkable. This method may be overriden if you want to customize what connections are valid. It must however hold that IsValidConnection(a,b) == IsValidConnection(b,a). This is used for calculating the connections when the graph is scanned or updated. Number of layers in the graph. For grid graphs this is always 1, for layered grid graphs it can be higher. The nodes array has the size width*depth*layerCount. Returns if there is an obstacle between the two nodes on the graph. This method is very similar to the other Linecast methods however it is much faster due to being able to use only integer math and not having to look up which node is closest to a particular input point. Returns if there is an obstacle between from and to on the graph. This is not the same as Physics.Linecast, this function traverses the graph and looks for collisions. This parameter is deprecated. It will be ignored. In 3.6.8 this method was rewritten to improve accuracy and performance. Previously it used a sampling approach which could cut corners of obstacles slightly and was pretty inefficient. The max position difference between two nodes to enable a connection. Set to 0 to ignore the value. The max slope in degrees for a node to be walkable. Index offset to get neighbour nodes. Added to a node's index to get a neighbour node index. Number of neighbours for each node. Either four, six, eight connections per node. Six connections is primarily for emulating hexagon graphs. Offsets in the X direction for neighbour nodes. Offsets in the Z direction for neighbour nodes. Nodes are laid out row by row. the last one has grid coordinates X=width-1, Z=depth-1. Size of one node in world units. How much penalty is applied depending on the slope of the terrain. At a 90 degree slope (not that exactly 90 degree slopes can occur, but almost 90 degree), this penalty is applied. At a 45 degree slope, half of this is applied and so on. Note that you may require very large values, a value of 1000 is equivalent to the cost of moving 1 world unit. How much extra to penalize very steep angles. Use position (y-coordinate) to calculate penalty. Scale factor for penalty when calculating from position. Offset for the position when calculating penalty. Relocate the grid graph using new settings. This will move all nodes in the graph to new positions which matches the new settings. Rotation of the grid in degrees. Updates unclampedSize from width, depth and nodeSize values. Also generates a new matrix . You should use this method instead of setting the width and depth fields as the grid dimensions are not defined by the width and depth variables but by the unclampedSize and center variables. Sets up neighbourOffsets with the current settings. neighbourOffsets, neighbourCosts, neighbourXOffsets and neighbourZOffsets are set up. 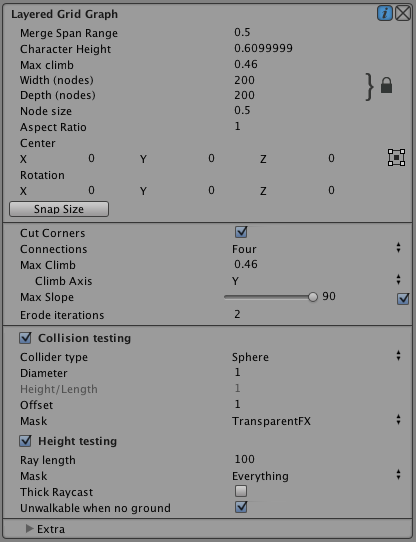 Show an outline of the grid nodes in the Unity Editor. Show the surface of the graph. Each node will be drawn as a square (unless e.g hexagon graph mode has been enabled). Show the connections between the grid nodes in the Unity Editor. Will always be positive and larger than nodeSize. Contains info on what was hit, see GraphHitInfo. This function is different from the other Linecast functions since it snaps the start and end positions to the centers of the closest nodes on the graph. This is not the same as Physics.Linecast, this function traverses the graph and looks for collisions. Since 3.6.8 this method uses the same implementation as the other linecast methods so there is no performance boost to using it. In 3.6.8 this method was rewritten and that fixed a large number of bugs. 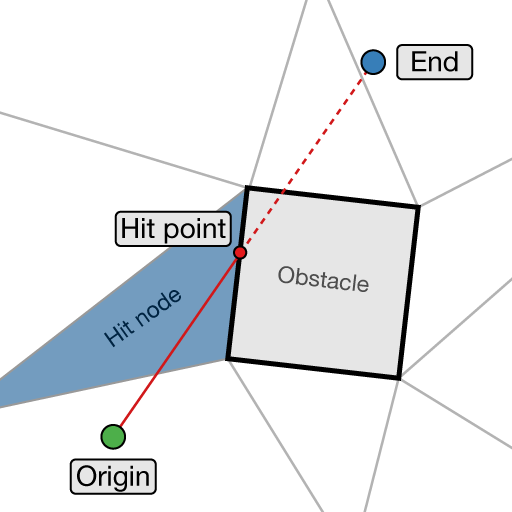 Previously it had not always followed the line exactly as it should have and the hit output was not very accurate (for example the hit point was just the node position instead of a point on the edge which was hit). 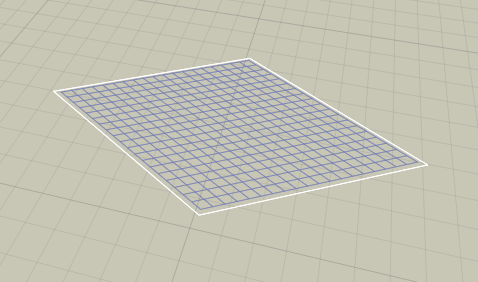 Holds settings for using a texture as source for a grid graph. Texure data can be used for fine grained control over how the graph will look. It can be used for positioning, penalty and walkability control. Below is a screenshot of a grid graph with a penalty map applied. 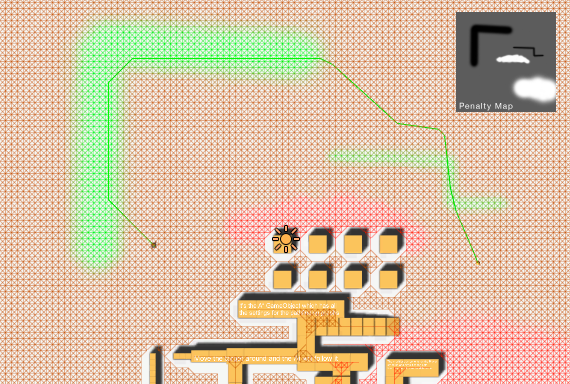 It has the effect of the AI taking the longer path along the green (low penalty) areas. Color data is got as 0...255 values. If true, all edge costs will be set to the same value. This is placed here so generators inheriting from this one can override it and set it to false. Updates the transform field which transforms graph space to world space. In graph space all nodes are laid out in the XZ plane with the first node having a corner in the origin. One unit in graph space is one node so the first node in the graph is at (0.5,0) the second one at (1.5,0) etc. This takes the current values of the parameters such as position and rotation into account. The transform that was used the last time the graph was scanned is stored in the transform field. The transform field is calculated using this method when the graph is scanned. The width, depth variables are also updated based on the unclampedSize field. Use jump point search to speed up pathfinding. Jump point search can improve pathfinding performance significantly by making use of some assumptions of the graph. More specifically it assumes a grid graph with no penalties. Width of the grid in nodes. Increases the capacity of the nodes array to hold more layers. Clips a line segment in graph space to the graph bounds. That is (0,0,0) is the bottom left corner of the graph and (width,0,depth) is the top right corner. The first node is placed at (0.5,y,0.5). One unit distance is the same as nodeSize. Returns false if the line segment does not intersect the graph at all. Magnitude of the cross product a x b. True if the node has any blocked connections. For 4 and 8 neighbours the 4 axis aligned connections will be checked. For 6 neighbours all 6 neighbours will be checked. Internal method used for erosion. All nodes inside the shape or if null, the bounding box. If a shape is supplied, it is assumed to be contained inside the bounding box. A rect with all nodes that the bounds could touch. This correctly handles rotated graphs and other transformations. The returned rect is guaranteed to not extend outside the graph bounds. Internal buffer used by SampleHeights. Which neighbours are going to be used when neighbours=6. This function will be called when this graph is destroyed. Fires a ray from the sky and returns a sample for everything it hits. The samples are ordered from the ground up. Samples that are close together are merged (see Pathfinding.LayerGridGraph.mergeSpanRange). The returned array is ephermal. It will be invalidated when this method is called again. If you need persistent results you should copy it. The returned array may be larger than the actual number of hits, the numHits out parameter indicates how many hits there actually were. Serializes graph type specific node data. This function can be overriden to serialize extra node information (or graph information for that matter) which cannot be serialized using the standard serialization. Serialize the data in any way you want and return a byte array. When loading, the exact same byte array will be passed to the DeserializeExtraInfo function. These functions will only be called if node serialization is enabled. Use heigh raycasting normal for max slope calculation. True if maxSlope is less than 90 degrees.